history - l.g.r originates from a voyage made to africa by the founder of the company, luca gnecchi ruscone. on a trip in 2005, luca visited one of the optical stores in asmara, eritrea owned by his grandfather who once lived in africa from 1930 to 1970. there he discovered a box of colonial period sunglasses, which had been imported from italy 50 years earlier. fascinated by the elegant design of the frames, luca brought the remaining pieces back to italy. the news of his special discovery was spread, and instantly requests poured in for these unique sunglasses. subsequently he tracked down the manufacturers and reopened the same laboratory, which closed in 1968. then he began a small production of the authentic frames, in respect to the traditional artisan methods of their original make using only high quality materials. soon after, luca had received his first order, and began to sell them on his own to exclusive fashion boutiques all over europe. following much success in 2007, he participated in a showroom event in paris, which resulted in his first published article about the brand in the prestigious magazine, vogue france. 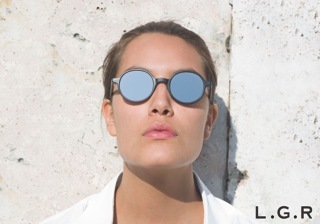 at the same time luca expanded the collection with new designs, and participated in his first optical show, silmo in 2008, which marked the official launch of l.g.r. from then on, l.g.r has worked with top opticians worldwide, and has remained an exclusive and well distributed brand. after these significant events, l.g.r continues to work hard on improving every aspect of the brand, and as a result it has become well respected for its quality, service, style, and elegance. handmade in italy - l.g.r eyewear is entirely handmade in italy by three artisanal families, who build each frame from start to finish using traditional methods of production in order to deliver a resistant and long lasting product. all frames can bend to adapt shape without heating due to their composition of cured cellulose acetate. they undergo a tumbling process with beech and birch wood that prepares the plastic frames for the final step which is polished by hand. the artisanal production of l.g.r preserves italian values through the concept of hard work by real people who have spent their lives specializing in a meticulous line of craftsmanship in order to deliver a product that achieves excellence, with passion and authenticity.